Manchester United goalkeeper David De Gea is expected to stay at Old Trafford beyond the end of the transfer window. De Gea missed Saturday's 1-0 win over Tottenham after manager Louis van Gaal said the 24-year-old lacked "focus" following interest from Real Madrid. United insist they will only sell to the La Liga side for a world-record fee for a goalkeeper, or if Spain defender Sergio Ramos, 29, comes the other way. And club officials are not expecting either to happen before 1 September. 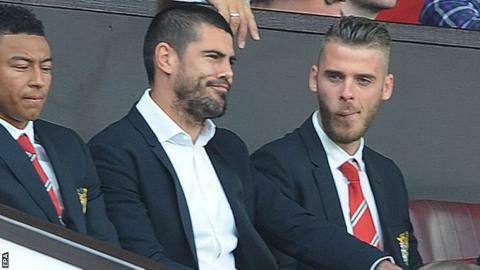 De Gea played against Barcelona and Paris St-Germain in pre-season but watched the Premier League opener from the stands as Argentina international Sergio Romero, 28, made his debut. He has been named in the United squad for the two-legged Champions League play-off against Belgium's Club Brugge this month. An appearance at this stage would not bar De Gea from playing for another club in the group stages and beyond. After the Spurs game, Van Gaal said it was possible De Gea could play for United again, but added the situation would not be reviewed until the transfer window closes. "He's our best player for the past two or three years so we cannot let him go so easily," Van Gaal said of the Spain international, who is out of contract next summer. "We want to sell at the same level as we pay. We want to keep him of course." De Gea has made 175 appearances for United since joining the club from Atletico Madrid in 2011 for a reported fee of £18.9m. The most ever paid for a goalkeeper is the £32.6m Juventus spent to sign Gianluigi Buffon from Parma in 2001. The uncertainty surrounding De Gea means a loan move to Preston for United's England Under-21 keeper Sam Johnstone is on hold. "We're waiting on different situations and have to see how it pans out," said Johnstone, who was on the bench at the weekend. Denmark international Anders Lindegaard is surplus to requirements at Old Trafford while De Gea's compatriot Victor Valdes has been made available for transfer after Van Gaal claimed he "refused to play" for the reserves.